I recently returned from a trip with my elder son, 23, to China. The theme of our trip was design. We intended to sketch and photograph our way through three different regions of China, getting a better sense of both classical and contemporary forms of design. To refine the concept of design, I focused mostly on understanding the design element of line. From architecture to fashion, room interiors to tea ceremonies, line plays a big role in defining the Chinese experience. But nowhere is the sense of line clearer than in Chinese calligraphy (which is nothing but line) and painting. 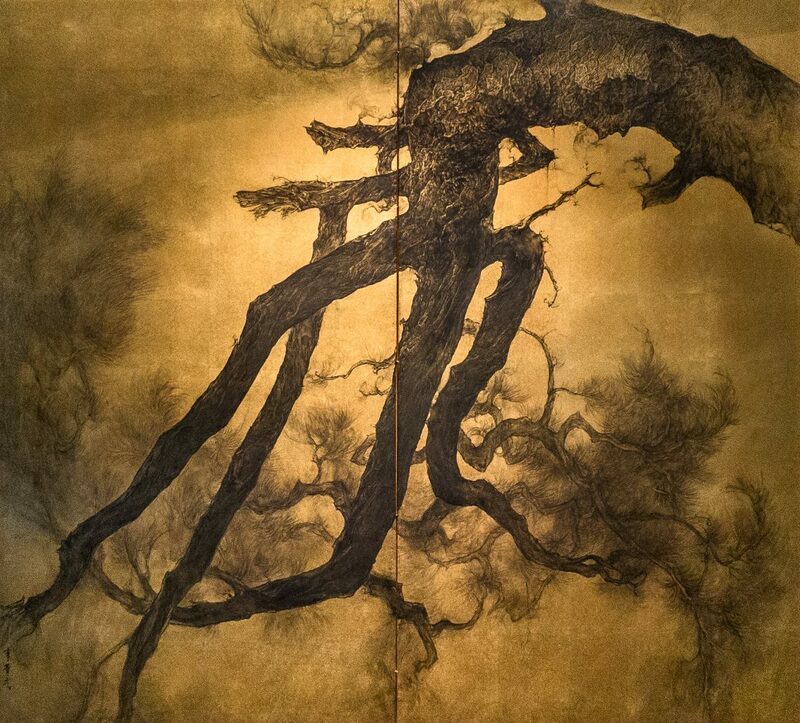 And no where on our trip did I find paintings that moved me as much as the work of artist Li Huayi. 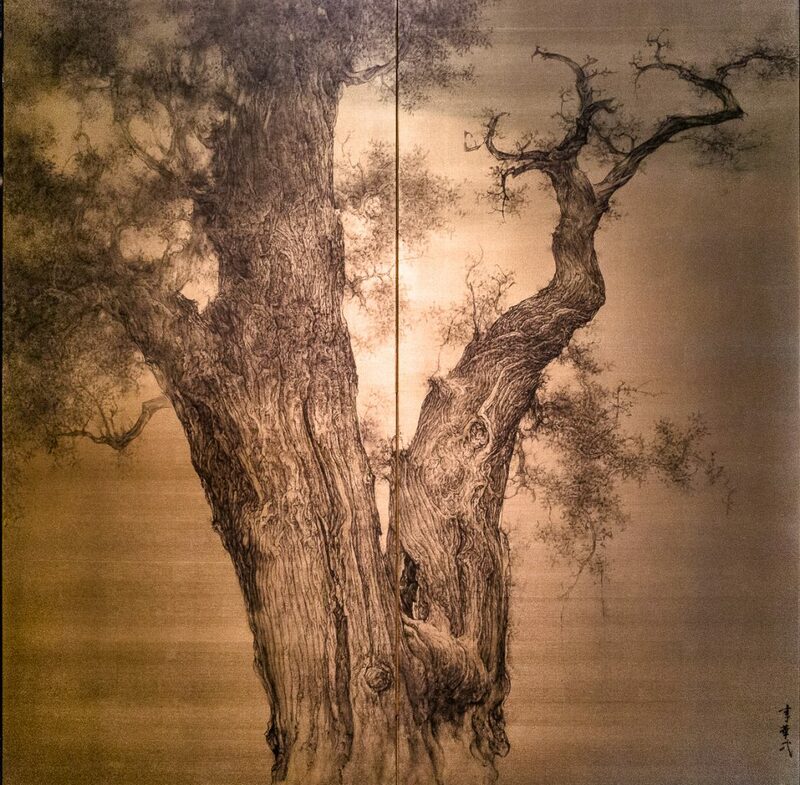 Li Huayi, born in 1948, learned painting in the traditional style in Shanghai. During the Cultural Revolution, he survived by painting works of propaganda. In 1982, he departed China for San Francisco, working there and delving into the world of Abstract Expressionism. 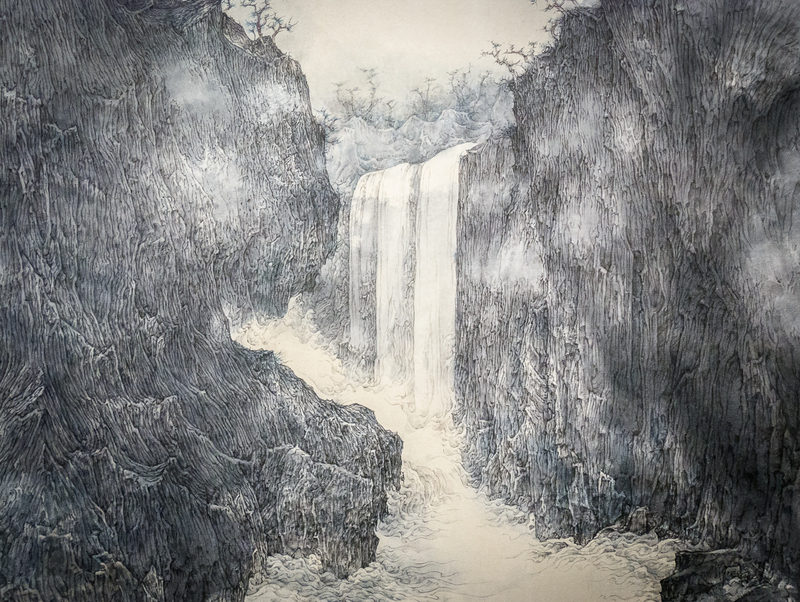 In the late 1990’s, however, he returned back both to China and to a focus on traditional Chinese landscape subjects and techniques. Today, he splits his time between studios in San Francisco and Beijing. 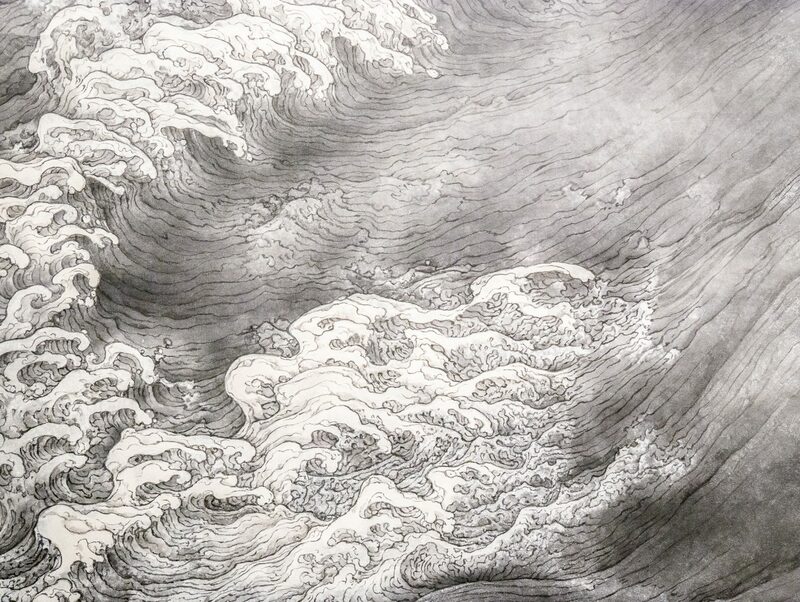 To say that Li Huayi’s work is merely a modern rendering of traditional subjects would be to miss what makes them so special. His paintings are currently part of a solo exhibition at the I.M. Pei-designed Suzhou Museum in Suzhou, China. 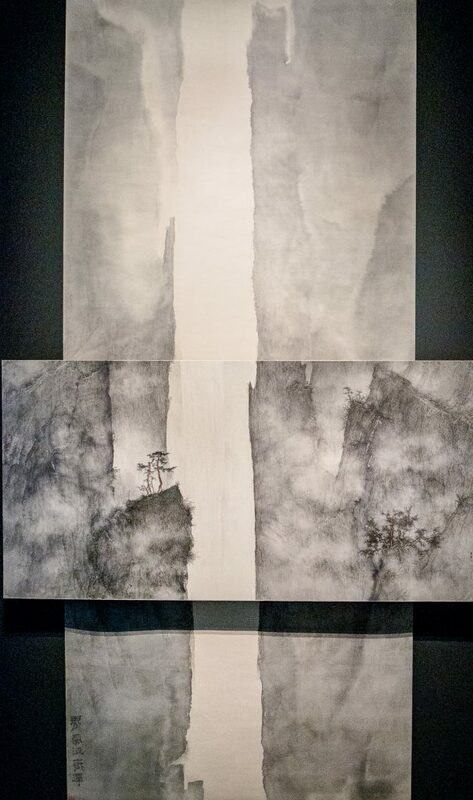 These works, on paper and silk, some shimmering with gold foil, reflect both Eastern and Western influences. 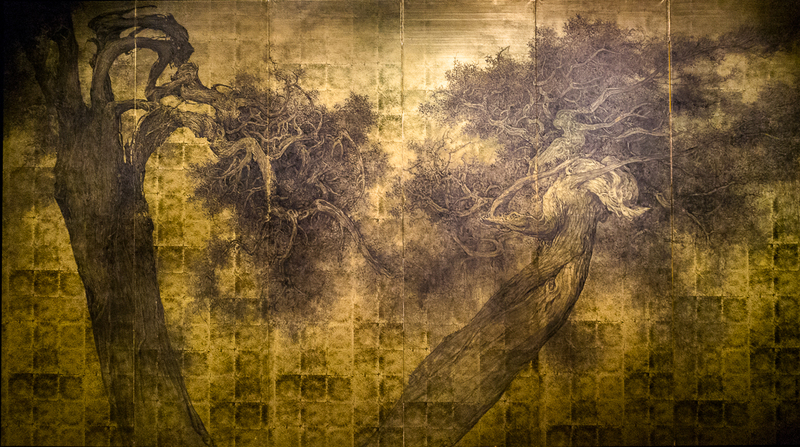 But it is less a fusion of cultures and more one of eras that add depth to Li’s paintings. 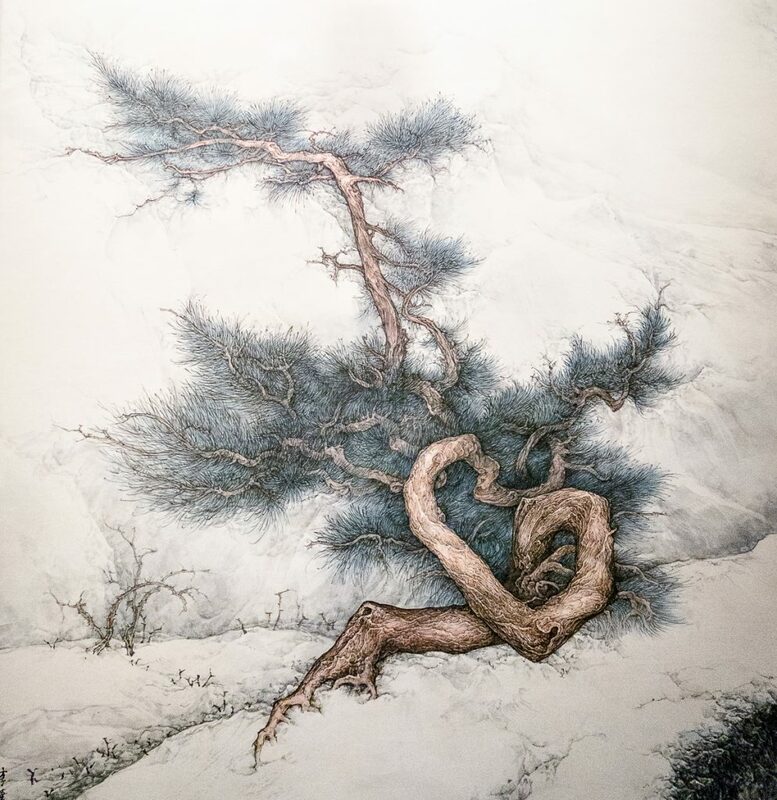 In them, some several meters in width or length, he blends themes going back to the Song dynasty with contemporary sensibilities and even subjects: some of his windswept trees seem more likely to be found in Carmel, California than Huangshan, China. The influence of Abstract Expressionism emerges in the atmospheric perspective of his backgrounds: you’re not quite sure on some what you’re seeing. This rendering of old and new also shows up in the presentation of some of the works with vertical scrolls hanging over longer horizontal pieces but the scenes blending perfectly. This is contemporary art that surprises because you don’t expect it to be that. 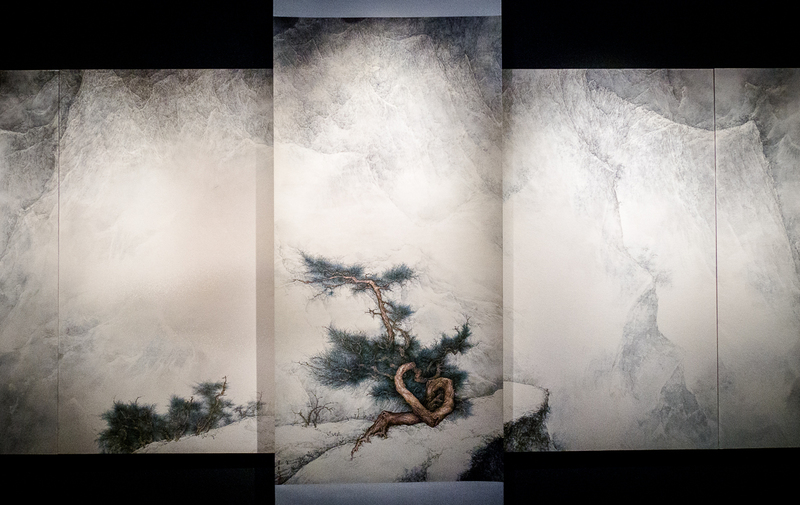 Learn more about Li Huayi and the exhibition at the Suzhou Museum. 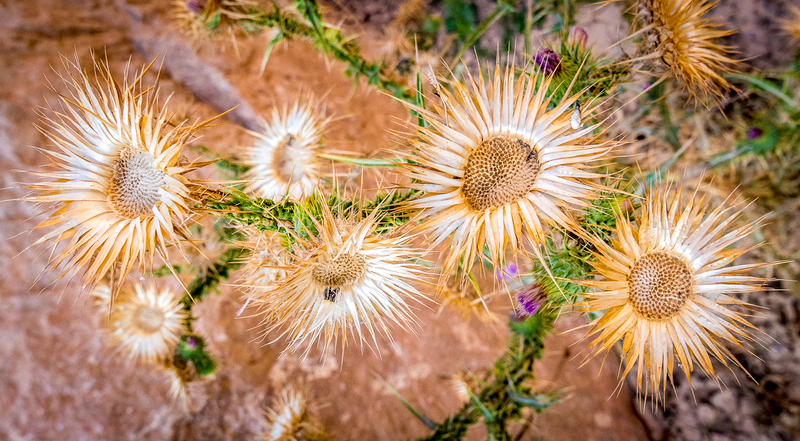 What follows is a personal exploration in noticing. 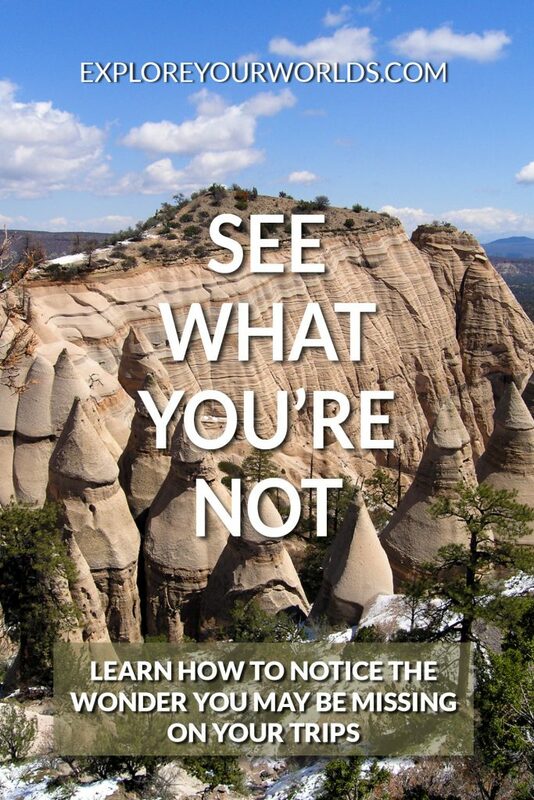 It’s my experience of learning how to pay better attention on a trip to New Mexico. But if you want a more direct “how to” in really seeing what you’re likely missing and knowing which details to look for, start here. Now, on with my story. As my flight to Santa Fe, New Mexico awaited take off, I flicked on my Kindle. Work had to wait until the magic 10,000 foot elevation that signaled that I could pull out my laptop. Until then, I glanced through the myriad titles on my Kindle. One caught my attention. Wired to Create. I vaguely recalled the book and was surprised to see I’d previously read almost half of it. Perhaps I’d remember more if I picked up where I left off. Within minutes, the authors were reminding me of the value of paying attention (rather ironic since I couldn’t remember anything I’d previously read in this book). They explained how essential truly seeing things is to the creative process. As I read the words, I realized something both profound and rather sad. It hit me that not only had I stopped noticing. I’d stopped noticing that I’d stopped noticing. In the busyness of daily business, I’d ceased to value the pause. The look. The curiosity of seeing something for the first time or as if for the first time. And so, although on a trip for business, I decided to be intentional. I would strive to see, to appreciate. Here are just a few of the things that I beheld in new ways. When you look at a cloud, what do you really see there? I don’t mean just the child’s ability to discern circus animals, a car driving through a donut or other fanciful imaginings. What exactly are you seeing in a cloud? Shape? Texture? Color? Proximity? Size? Variation? Familiarity? Why is it shaped the way it is? Is it a cirrus, cumulus or stratus cloud? Do you even know the difference (I had to look them up)? How can what makes up that cloud be the same thing we drink in a glass or that sinks ocean liners? 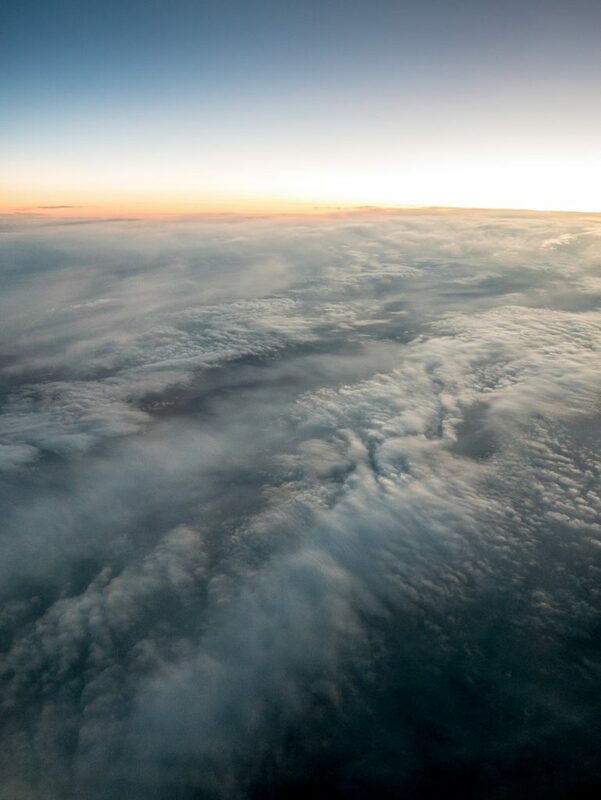 Clouds are wonders, truly. But too often for me they don’t even register. I sat through my meetings in Santa Fe looking out on a wet day. I seem to endure weather rather than notice it. But in a town that gets 350 sunny days a year, beholding downpours throughout the day got my attention. Then, as we wrapped up our meetings, the sun came out. So my colleagues and I headed out for a stroll around town before dinner. Near Santa Fe’s cathedral, I noticed something that rarely registers: moisture on the road. In any other place, this might be commonplace. 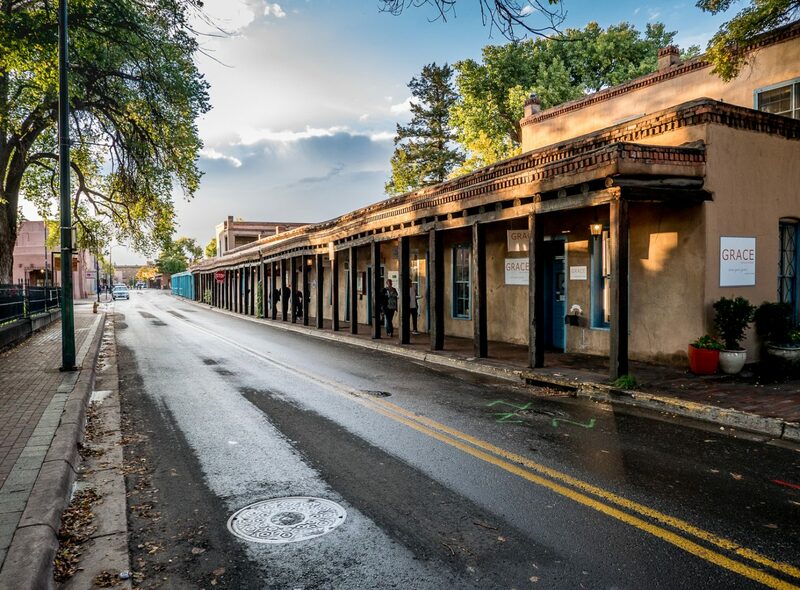 But here in Santa Fe, that wet street was a thing of beauty, particularly in the late afternoon light. I even paid attention to the manhole cover, as well as the more obvious colonnade and the uneven lines of its roof. An ordinary scene made profoundly beautiful not just by the weather, but by my seeing the weather in the scene. 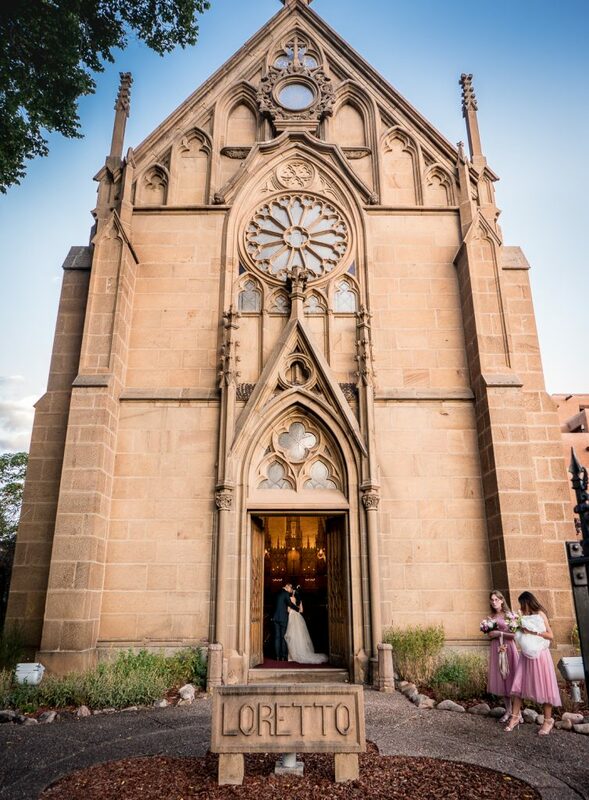 I wanted to take a photo of the Loretto Chapel just because…well, I think because I was in tourist mode and felt it was something I should photograph. I’d been there before and had seen the famed spiral staircase built by an itinerant carpenter in a manner that defies logic as to how it can stand without support. All that initially occupied my thinking. But then I noticed the human element. A wedding. And in the doorway, the newlyweds having wedding photos shot. A whole story right before me that so easily could have been lost in the focus on the architecture itself. I rarely pay attention to or name the shapes of things. Yet, in learning to draw, that’s exactly what I must do. 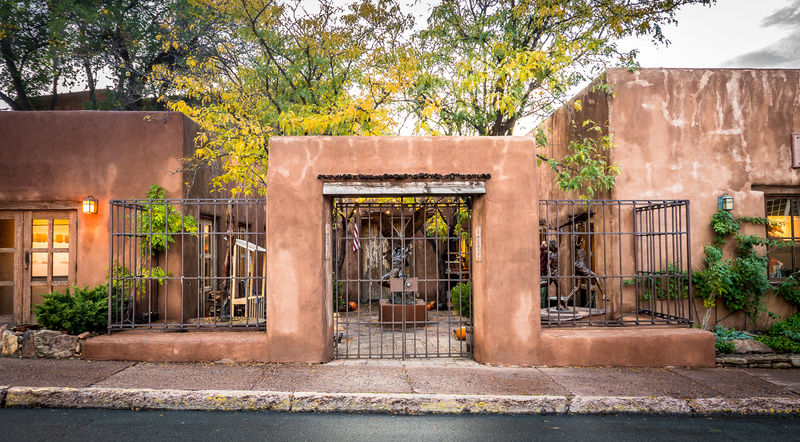 If I were to draw this building, a gallery in Santa Fe, I wouldn’t think, “Door. Gateway. Fence. Window.” Those labels evoke stereotypes of what a door, fence, window, etc. should be. Thus, I’m more likely to draw the stereotype than the actual scene before me. But if I put aside the labels and see what is there, I behold mostly squares and rectangles, with a trapazoid or two thrown in their due to the slope of the street. I see what is there, not what I think is there. I looked down an alley. 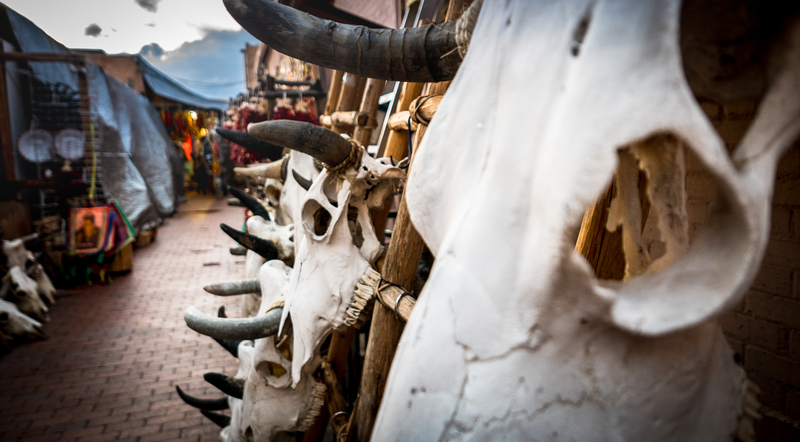 This row of cow skulls being sold alongside other Southwestern decor items grabbed my attention. When did you last see a row of dead cow heads hanging on the wall (at pretty prices as well)? But what I really noticed was the size of the eye socket. Cows have big eyes. Yes, I’ve noticed that fall is here. Yes, I’ve even commented to my wife at home that the leaves are changing. 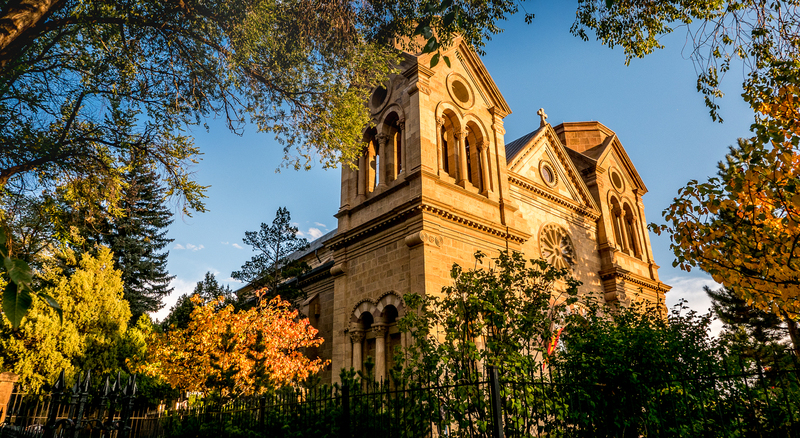 But no, I haven’t bothered to appreciate the beauty of this season until a few bright trees framed Santa Fe’s cathedral nicely. It wasn’t just the leaves I noticed. The overall light of this evening in this place at this time of year. All that registered in a way I rarely allow in part, I believe, because I was not at home. Travel helps us perceive exactly what we see at home but in new ways. The entire intent of a window display is to get us to notice. But as an avid non-shopper, a store’s arrangement of goods barely gets a glance from me. But here in Santa Fe, now in the evening, the stores were closed. And when I ceased to think about them as stores and more as repositories of items that warranted my attention, I discovered a world of curiosities. 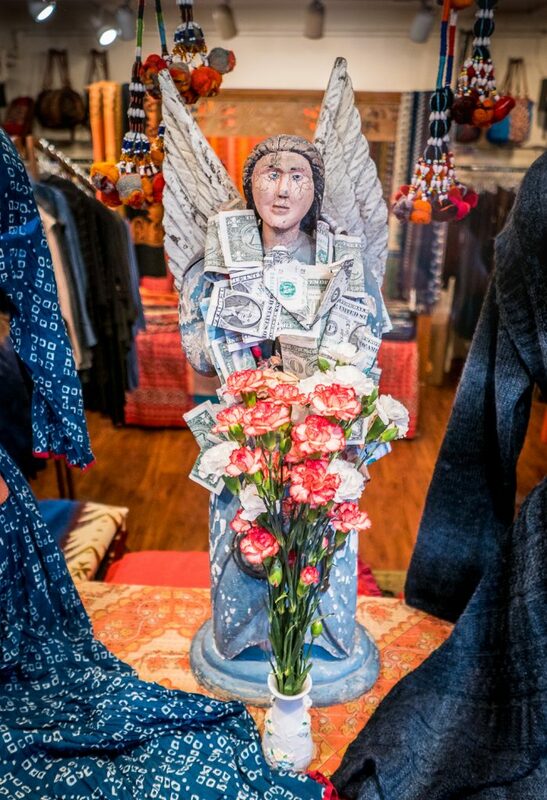 Including a very well-to-do angel. It’s so easy for me to think that I don’t have the time to notice everything around me. But let me reframe that. Maybe I don’t have the time NOT to notice. Life is too short not to appreciate the fullness of it all around me. Autopilot works really well for getting us through each day. Habits help. Routines make us efficient. But just getting through the day isn’t enough, is it? Try this. Don’t worry about suddenly having to pay attention to everything around you. Just tell yourself that you will notice one new thing each day. One thing you’ve never really seen before or that maybe you’ve beheld, but never truly seen. One thing. That’s it. Then try it again tomorrow and the next day. Now stop looking at this screen and go take a look at a world that is just waiting to be seen. To aid you in this, get a copy of my free Guide to Seeing the Right Details by Asking the Right Questions. It will help you focus on the details that matter to you so you don’t get overwhelmed by everything new you see on a trip. If you want practical, hands-on tips and techniques for learning to see in a new way, get this guide. Passion doesn’t always arrive in the ways you expect. After a day touring through quaint villages and lonely byways of England’s Cotswolds region, we were ready for a relaxing evening at our inn, The Village Pub in Barnsley. Yet as we turned into the inn’s parking lot, we had to negotiate our way around an unfamiliar object. 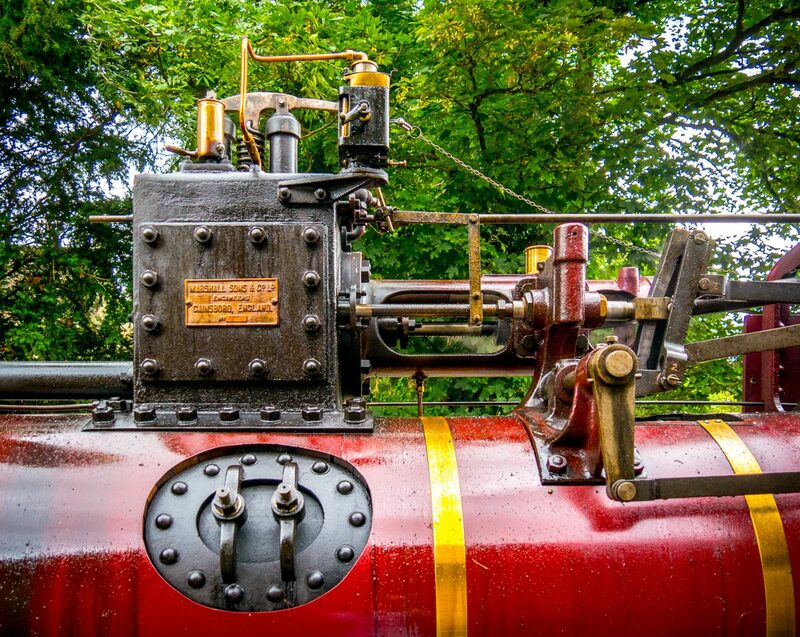 There, in splendid redness on the side of the road, amidst the low rumble of its engine and the vapor spewing from multiple vents and seams sat a steam engine. The image above will explain far better than I can. Apart from museums or books, I’d never beheld such a machine before, at least on this scale. When I was a kid, I dreamed of making a model steam engine, but even though the versions I saw were far less ambitious than this one (the models were stationary and about six inches long), the cost and complexity exceeded my paper route income and tween metalworking skills. I was fascinated then by the very elements that made this behemoth so wondrous: intricate metal parts and fittings combined with the heft of huge iron and steel components. Each rear wheel likely weighed more than my car. I approached the man clamoring over the vehicle and, unable to articulate any coherent specific question, said simply, “Tell me the story here.” He came over, arms and hands blackened with grease. His name was Chris Larson. 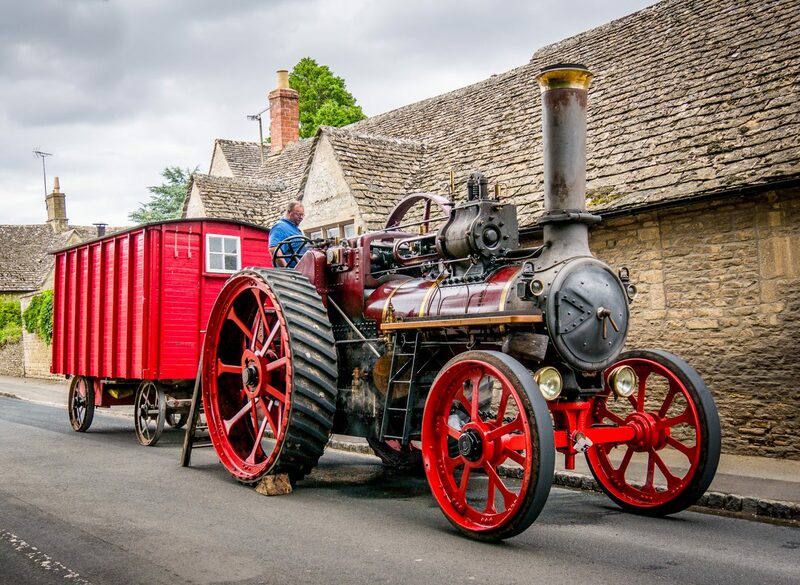 He and his wife, who was busy talking to an inquisitive server from the inn, were on their way to a steam festival down the road. They’d stopped at the inn for dinner since at four miles per hour, theirs had been a long journey from central Dorset county. It was a drive I would make in 90 minutes the next day but one that had taken them most of two days to accomplish. 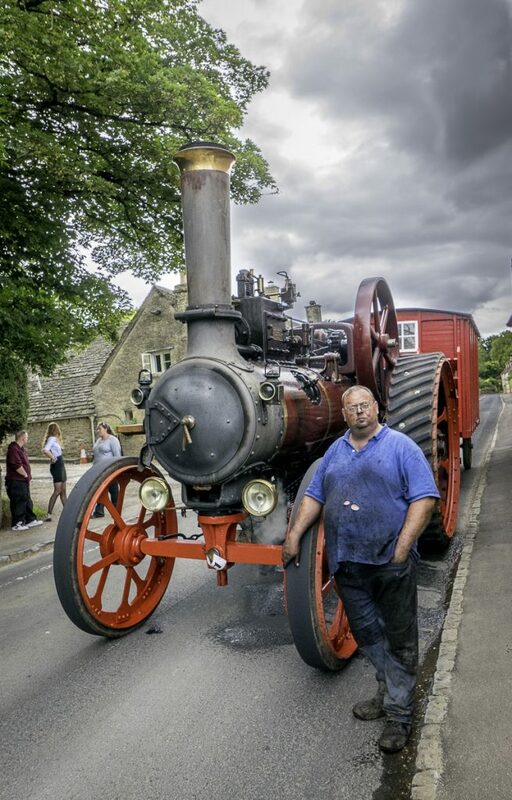 When he mentioned a steam festival, my naive response was, “You mean there are more of these machines out there?” Indeed, there are. 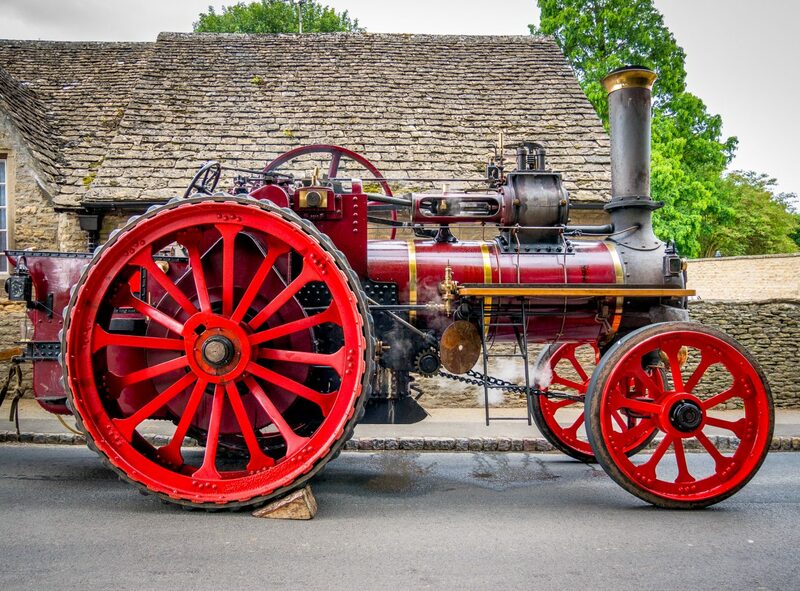 Over a hundred steam engines would be at this festival and there were dozens of these festivals across the country. 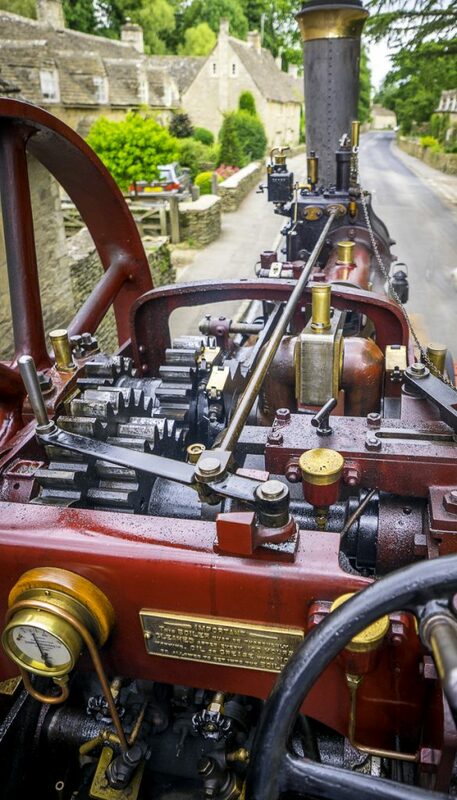 An entire sub-culture of steam engine enthusiasts existed. Chris invited me up into the driver’s area. We had to use a ladder propped against the rear wheel to do this. He showed me how he fed coal into the furnace and explained how he’d made this giant beast of a vehicle practically from scratch. He whipped out his phone (a rather anachronistic moment standing in a century-old vehicle using a 21st century mobile device) and showed me photos of the initial pieces he’d bought: part of the engine block, elements of a wheel and a few other odds and ends. My guess is that all of those original components amounted to at best 20-30% of this final vehicle. That meant he’d machined, forged, manufactured, scavenged and assembled all the rest on his own. Amazing. Eventually, I had to let him go dine with his wife. I wondered how he was going to clean up those greasy arms for the rather upscale pub dining room. But the two of them ate outside on the patio and I left them to enjoy their meal in private. 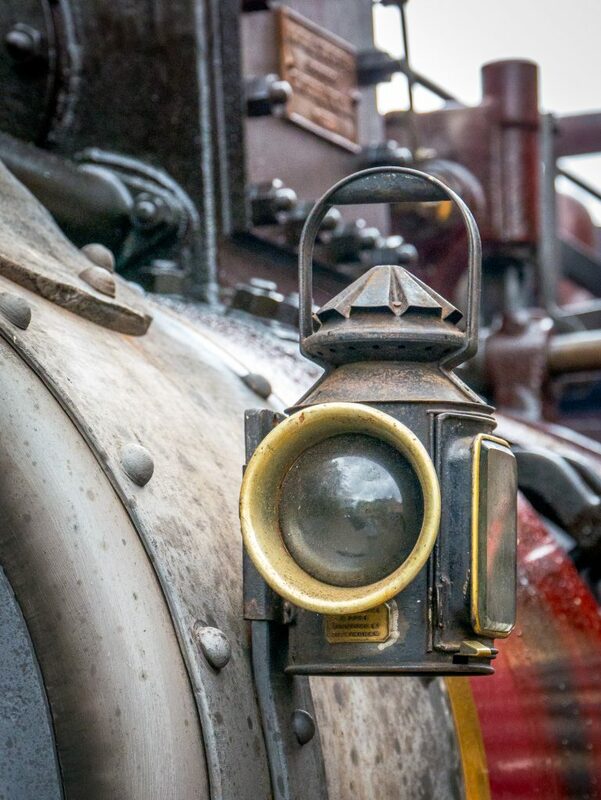 Besides the marvel of encountering something so unexpected, seeing Chris’s steam engine and all the associations, memories and nostalgic longings it evoked made me realize something. Chris had found his passion. He’d dedicated untold hours and a good deal of expense, I’m sure, in building that steam engine. 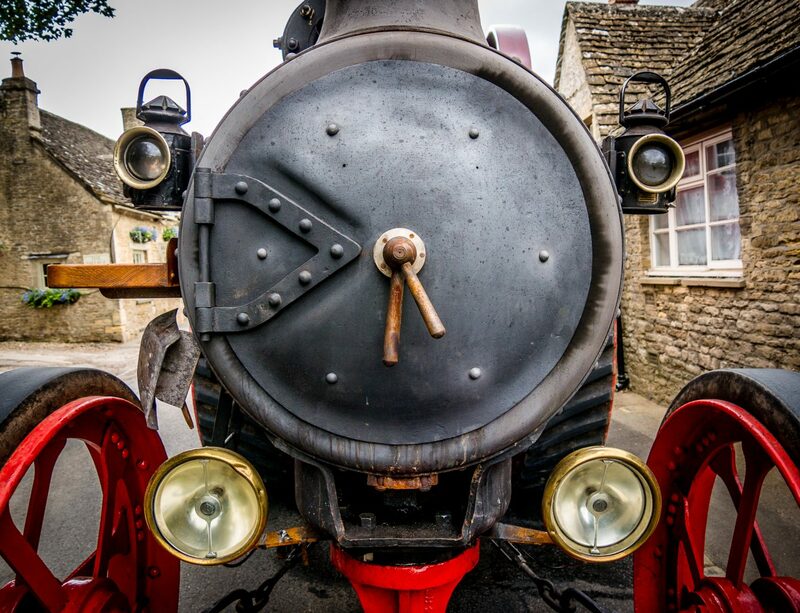 Now, as he tours the various steam festivals, he can show off his work to wonder-eyed kids of all ages – like me. He’s able to connect with others who share that passion or are awakened to one they never realized they had. He, in short, lives in a world consumed by what brings him joy. Before we turned into the inn’s parking lot, I didn’t know that any such steam engines still existed, especially in such great working order. So it makes me wonder: What else might be out there that grabs my heart? My passion? I’m not planning on building my own steam engine any time soon. But it delights me to know there are others that are. It brings me a deep sense of gladness to realize this world is filled with people who do follow their dreams. Who take their passion seriously. Who tackle seemingly insurmountable challenges to bring to life what others don’t even imagine as possible. Who then find similar dreamers and doers who support, encourage and help them to carry on. I’m inspired to build, to make, to create. I’m not sure what it will be yet. But like that moment when I first saw Chris’s steam engine, I expect it will come on almost like magic. Research possibilities. Before your trip, research everything you can about your hobbies in the places you visit. A Google search with the country name and your hobby name will produce some great starting points. Pursue them. Connect with others. Find out about fellow practitioners of your hobby in the same way. Try Facebook Groups or Reddit or other hangouts of people interested in your interest. Ask there about the places you’ll visit. You’ll uncover some great leads and may even make some new friends you can visit once you’re there. Expand the reach of your hobby. Let’s say you like to paint. Obviously, you’ll want to visit galleries and museums, but also hunt down art supply stores, find out about local classes or gatherings of other artists. Investigate different media and techniques (e.g. 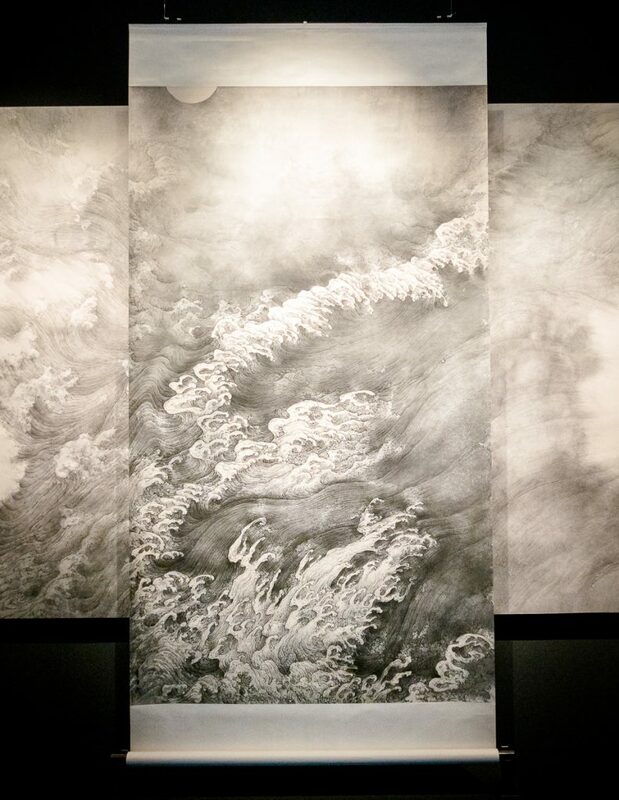 what can you learn from watching Japanese artists using calligraphy brushes?). Hunt down local practitioners. If you love gardening, visit not only formal gardens, but nurseries where you can meet local gardeners. Strike up a conversation (if language permits). Who knows where that can lead? Be open to new creative interests. 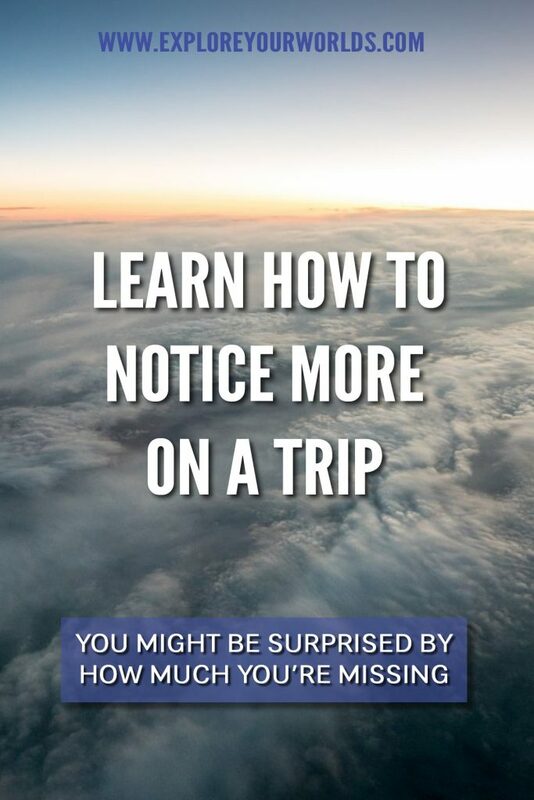 This is one of the best benefits of travel: It exposes you to ideas, new approaches, inspiration and completely new areas that you may never have known about at home. You may discover a new sport, a new game, a new form of weaving or architecture or industrial design. Keep your eyes open for new possibilities. Note the differences. Pay attention to how locals in the place you’re visiting do the same things we do, only differently. Note how their billboards vary from ours. How ordering a coffee isn’t the same. How hot water comes from unusual types of heaters. How “common sense” isn’t as common there. This isn’t just an anthropological study in cultural differences. It’s a quest to uncover creative possibilities that spring from noticing familiar items or approaches in new ways. For that, seeing the familiar in a new way, is the heart of all creativity. Say yes. Let go of your hesitations and engage in new activities you’d never try at home. This is your chance to make a glorious fool of yourself because no one will care. Experiment. Accept invitations. Explore. Treat your trip as a scavenger hunt for new sources of inspiration and if you do, if you’re open to all sorts of new opportunities, you’ll find far more than you thought possible. What hobbies or new creative interests have you indulged in or discovered on a trip? 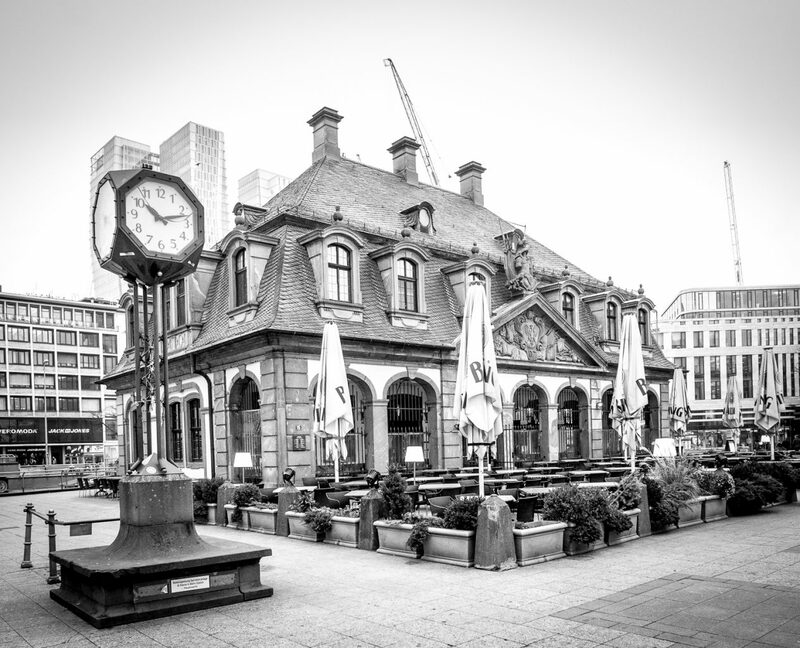 Got a stopover in Frankfurt? UPDATE: I’ve updated the information below as of October 2018. The main changes are the track from the airport station is now on track (Gleis) 2 since track 1 is being worked on, and all the new buildings in the Old City (Altstadt) that were finished earlier in 2018. See below for details. Frankfurt is a surprisingly beautiful city. 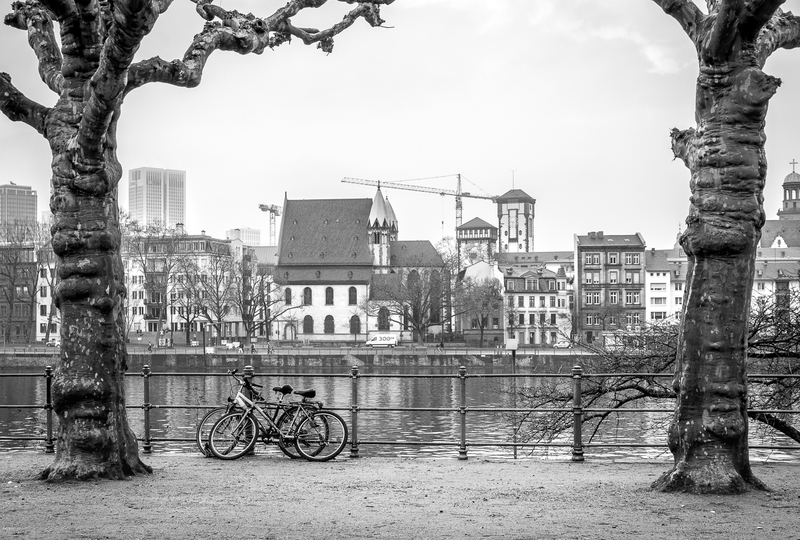 I wouldn’t necessarily make it a destination on a trip to Germany, but if you are passing through, there are many ways you could spend a few hours to a full day in Frankfurt. The downtown area is only 15 minutes by train from the airport and all the main sights are within walking distance once you get there. Plus, if you’re a photographer, there are many opportunities to make some great images. In terms of timing, I had a six-hour Frankfurt stopover. This means I effectively had only two-and-a-half hours to explore after factoring in time to clear inbound customs, store my bags, get to the train station, catch the train downtown and back, check in two hours before my next flight and go back through security. It was still enough and it makes for a fun adventure that helps keep you awake after a long flight. If you have a Frankfurt stopover of four or even five hours or less with an international connection during the busy season (I was there in February, so shorter lines) I don’t think it would work to try and visit downtown. No sight there is worth missing your connection! However, that doesn’t mean you’re at a loss for things to do. Here’s a very helpful overview of services at the Frankfurt airport. One of the options noted is a tour of the airport itself (the 11th busiest in the world) but keep in mind that most of these tours are in German only. Still, if you check out the reviews, many people find it quite interesting. There are also some other things you can do at the airport itself. However, why not do it on your own? Especially if you are a photographer or just keen on architecture, Frankfurt offers some wonderful opportunities to make some great shots. Besides, when I looked at what was included on most of these tours, everything listed tended to be things you could see for yourself. Let me show you what I did and then give you some additional options as well. First, let’s get you out of the airport. I arrived in Terminal 2, so I’ll explain that route. If you arrive in Terminal 1, it is actually easier since the train station (you’ll be taking the S-Bahn or local train into downtown Frankfurt) is across from Terminal 1. For Terminal 2, I got off the plane and had to go through passport control. Depending on the line, this could take five to thirty five minutes. You never know. For me, it was only about five minutes. If you have checked a bag, you’ll need to pick this up unless it has been checked through to your final destination. As you exit passport control, you go down a long hallway. You’ll notice they have showers on the right in case you want to clean up after a long flight. You can always access this later, after your walking tour. You’ll go down the escalator (to your left) and as you exit the restricted area, the baggage storage (Gepackaufbewarhung) is to your immediate right. There’s also a set of restrooms here. I mention this because finding public restrooms downtown isn’t so easy, so go while you can! At baggage storage, you can drop off your bag(s) and get the receipt. You’ll pay 7 euros for 2 to 24 hours when you pick your bag(s) up. From there, continue straight out then turn left toward the exit signs. Along the way, stop at one of the many ATMs so you have at least a few euros (you’ll need about 10 euros per person for the round trip to/from downtown by train). The train ticket machines don’t always work with US credit cards, so it is easier if you have cash. After that, go to the Information desk near the exit and ask for a map of Frankfurt. They were super helpful here and speak excellent English, so if you want, you can confirm your details about getting downtown and back. Tell them your connecting flight since they also know the usual wait times for when to check back in for the next leg of your journey. Head outside and immediately, you’ll see a sign for the bus for Terminal 1. You’ll take that bus and get off when it stops and head into the train station. It can be a bit confusing finding your way here, but follow the signs for Gleis 1 2 (Track 1 2 is now the one for the train going downtown). First, however, find the ticket machines. Here’s the key (which I missed the first time I was here): The options for other languages are on the bottom of the screen. Look for the icon of the British flag and select it. I speak fair German but even so, the first time I came through, I was a bit confused with the options in German. So look for the English language selection and your life will be simpler. Select the day pass (Tageskarte Frankfurt) if you’re coming back the same day. It is about the same as two one-way tickets and easier than having to buy a ticket again. There is also a one-day Frankfurt Card for about 1.40 euros more than the day pass and includes unlimited transport for a day plus discounts on museums and many sights. The only challenge is that you’ll need to get this card at the Hotels and Tours desk in the Welcome Center, Terminal 1, Arrival Hall B since they don’t sell it at the train station itself. If you’re arriving late and staying over, just get a one-way ticket (Einzelfahrt) for 4.80 euros since the day pass is for that specific day, not a 24-hour period. Look for the sign and stairs leading down to Gleis (track) 1 2. Then, wait for and board the next train. 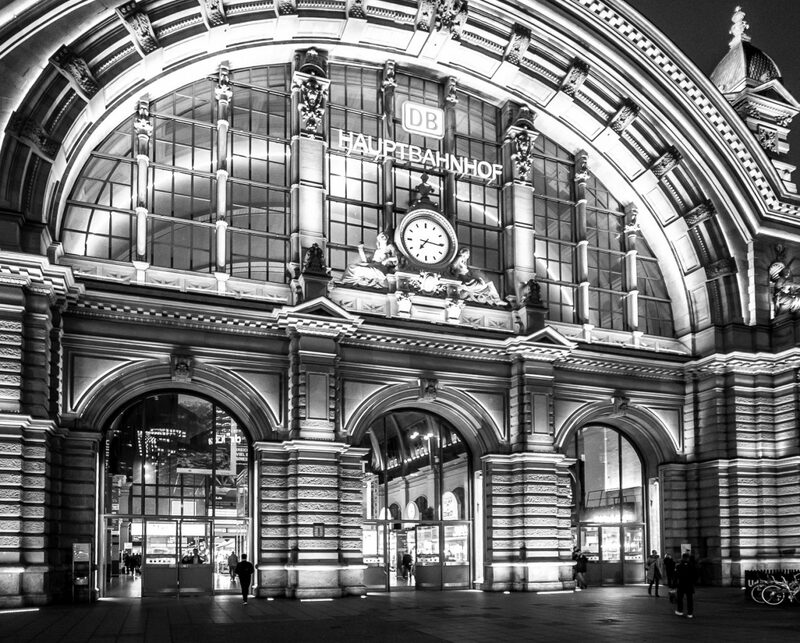 I recommend that you head to the Hauptwache stop which is two stops past the Hauptbahnhof (main train station) stop. If you have limited time, the area around the main train station, while much less seedy than it used to be, isn’t really worth the effort with one exception: The train station itself offers some very interesting photo opportunities. So if you have the time, consider walking there at the end of your tour (I’ll explain below). But for now, stay on the train till Hauptwache which is closer to all the main areas of interest. It will take about 15 minutes to get to Hauptwache from the airport. Once you get there, you can use this map or the one linked to below for the city tour. From here, you can just wander around the large stores in the area, but if you want some interesting photos, I suggest you look for the largest street, Zeil, and head up that just a few dozen yards until you see the glass fronted mall with diamond patterns and what looks like a giant hole in the middle. 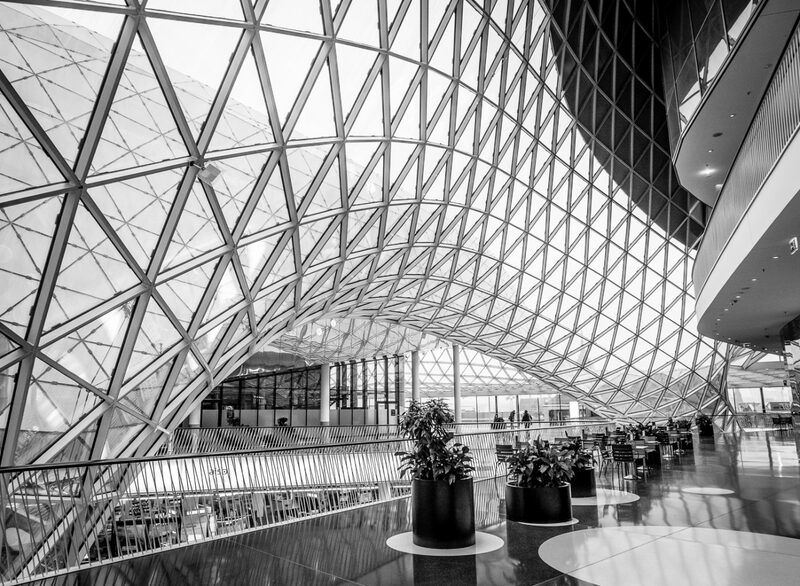 That’s MYZeil Shopping Center (follow this link for images of the outside of it). 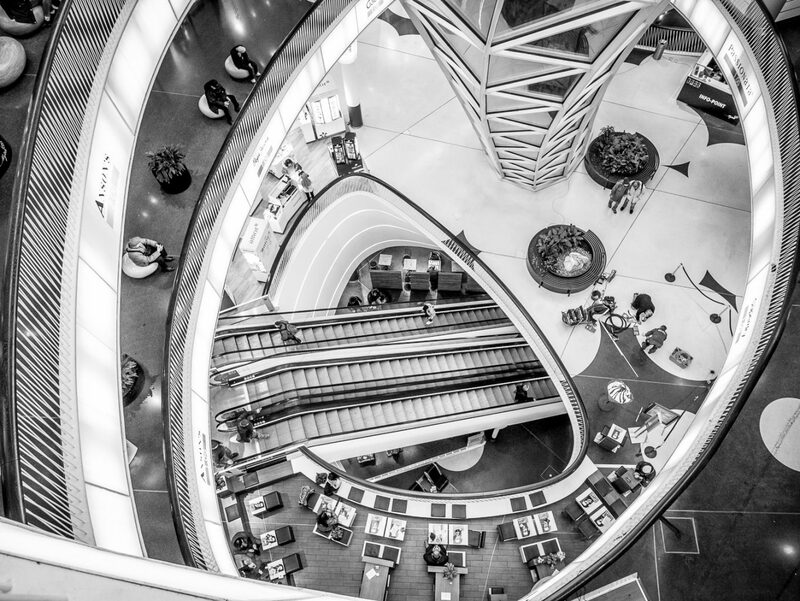 You can shop here, but visually, you’ll find some really great architecture and angles inside. Head to the top and count yourself fortunate if it is raining since the water running down the glass forms intriguing patterns. Next, go back out the way you came in, turn left and when you reach Hasengasse, turn right. 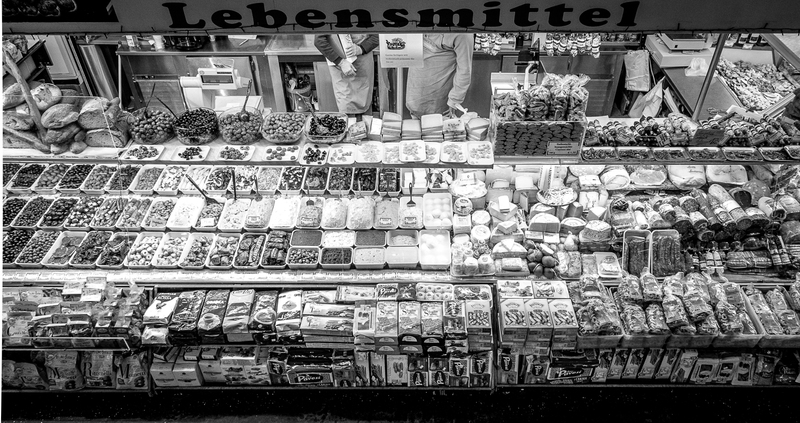 You’ll go about three blocks then on your right, look for rather small signs for the Kleinmarkthalle. I hope you’re hungry! 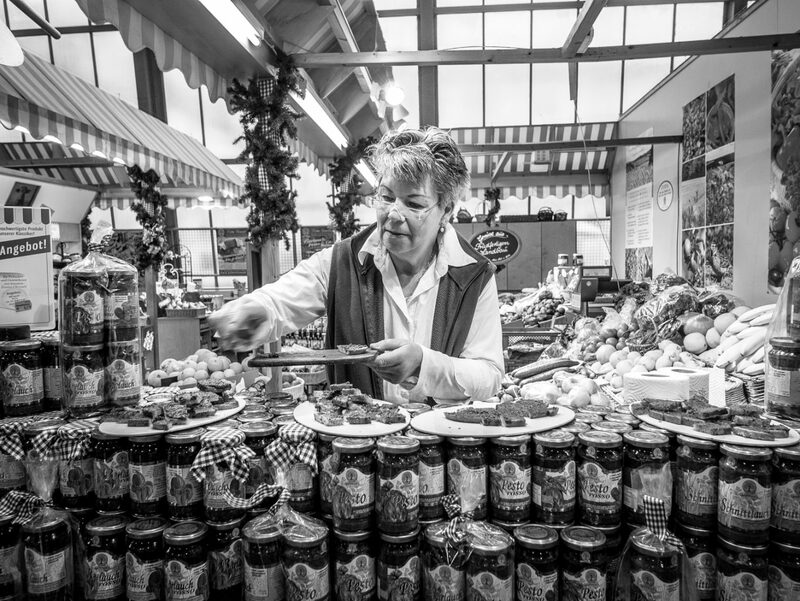 This is essentially an indoor food market with high-end fresh food and other products. It’s like Costco, in terms of all the samples, only with really good food. There are actual restaurants upstairs, but you can load up on picnic supplies here or make a meal from the samples, some bread, fruit, meat and cheese or whatever you like. 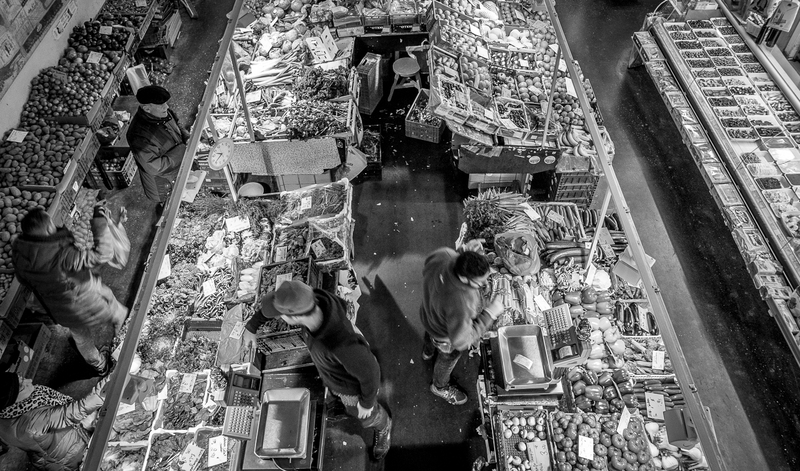 Mostly, it offers some wonderful photo opportunities of both the food and the people buying and selling it. 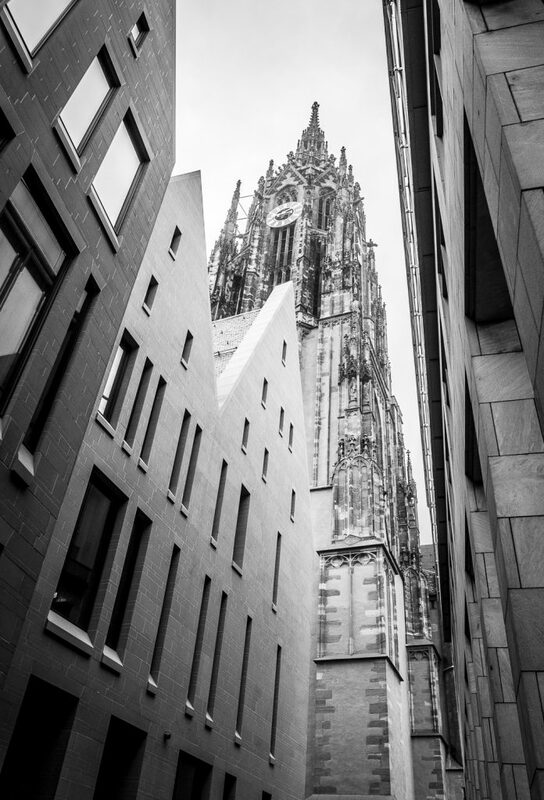 Go back out the same way you came in, turn right and head about four blocks down to Kaiserdom (St. Bartholomew’s Cathedral) with its magnificent tower surrounded by more modern buildings. At this point, I’m going to give you two choices. You could combine the two with some backtracking, but let me explain your options. The first is better if you’re mostly interested in the traditional sights of Frankfurt and want a bit of history and background along the way. For this city tour, rather than me reinventing the wheel, I suggest you check out this virtual tour of the city that provides helpful background on each location. It starts at the Cathedral, circles you back to Hauptwache (where you can catch the train back to the airport) but also provides some additional stops beyond that if you have time. Here’s the downloadable PDF version of the city tour so you can print it out if you prefer. The second is more for those who just enjoy walking and want photos that are going to be different than the usual tourist shots. Also, this is for those who may want to take in a bit of art as well. This is the one I did. 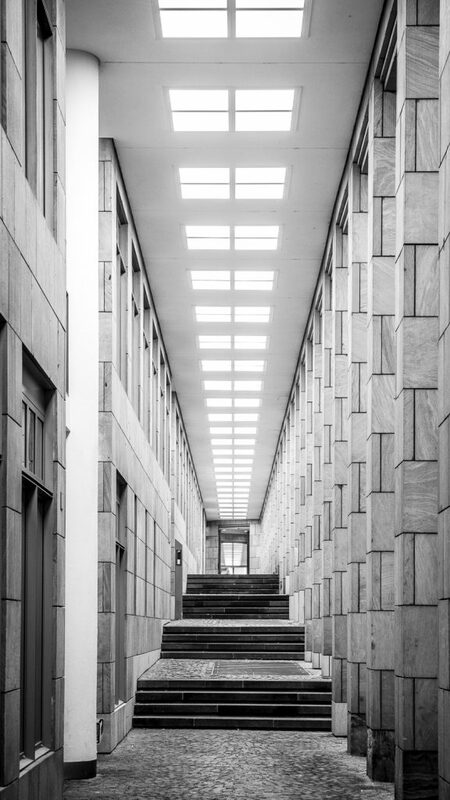 Continuing using the Google map above, head toward Romerburg from the Cathedral pausing to take a look at all the interesting architectural photo possibilities of these long hallways along Bendergasse around the Schirn Kunsthalle (art hall, where you can stop and see their exhibit if you have time). 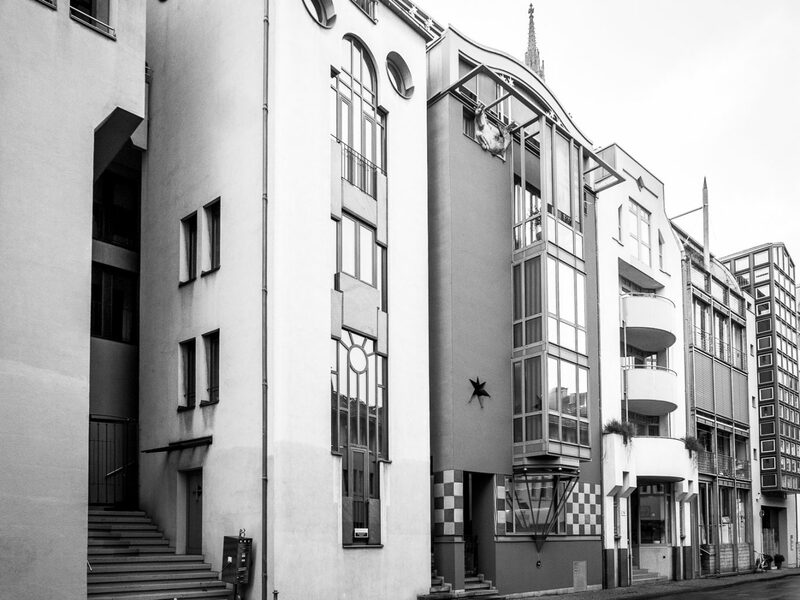 At this point, cut through the buildings (or go around if you can’t find the courtyard that goes through) for a quick detour along Saalsgasse for a row of buildings reconstructed by a variety of artists using postmodern design principles. Continue down Saalsgasse (heading away from the Cathedral) until you reach Roemerberg. 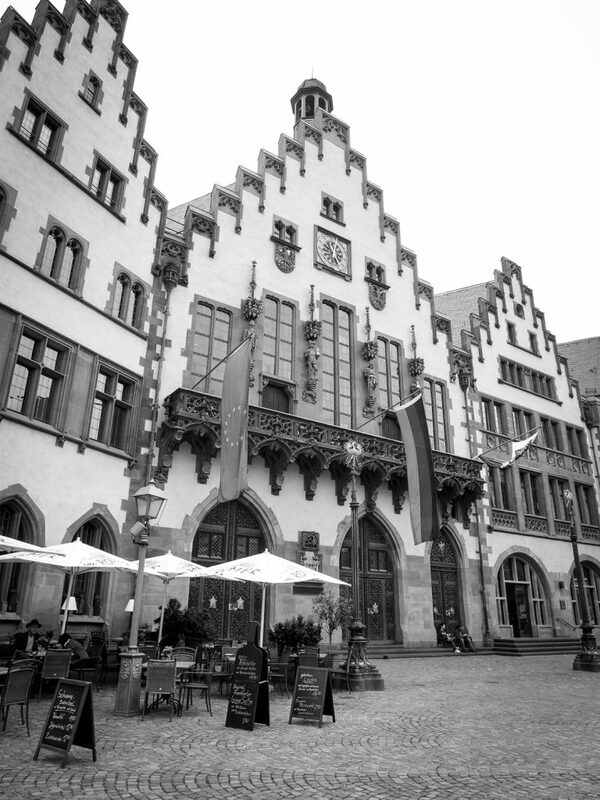 Turn right and you’ll find the main Roemerberg square and the most complete set of Medieval buildings in Frankfurt (reconstructed after the originals were destroyed in WWII bombing). UPDATE: In addition to the Roemerberg square, there is now an entire new section of reconstructed buildings known as the Neu Altstadt (new old town) that you can explore. These lie between the Cathedral and the Roemerberg square and consists of shops, cafes and museums. Look around and keep an eye out for great photo opps of the many tourists playing around the square. Backtrack a bit and head to the river and look for the pedestrian-only bridge ahead and slightly to your right. 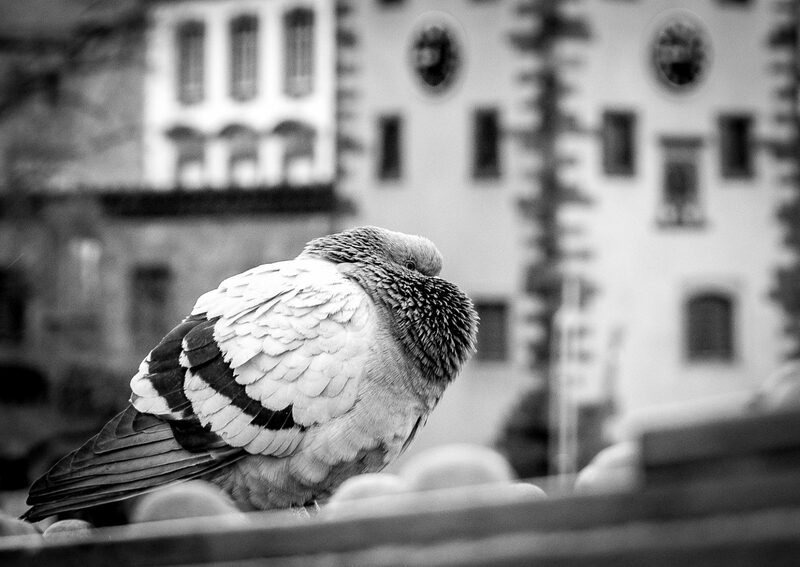 Stop at the entry tower for good shots of the city historical museum (shown behind our feathery friend above), then go out onto the bridge and take in all the romance of the thousands of padlocks attached to the bridge as a sign of undying love. Return back to where you got on the bridge and turn left. 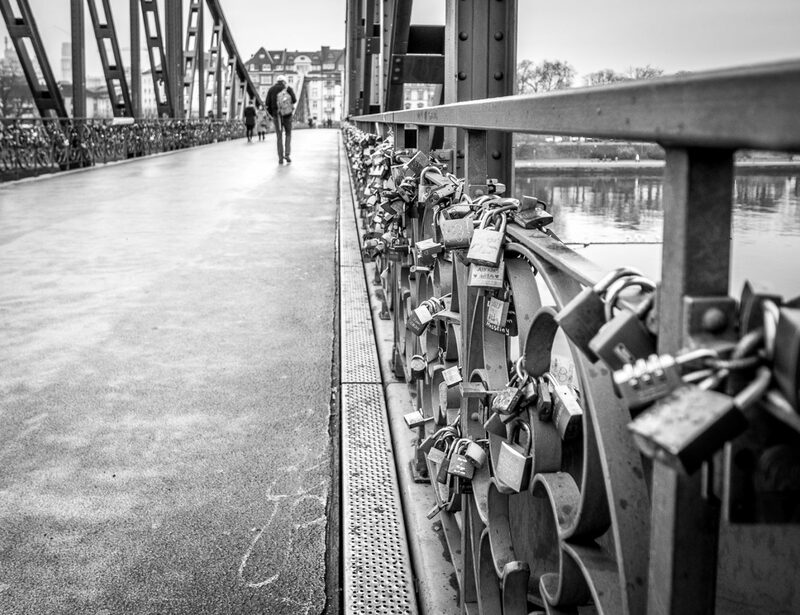 Here, there’s no singular sight to see, just a lovely tree-lined walkway that parallels the river and offers a wealth of views of the river, the surrounding area, the trees and all those Frankfurters living out their lives along their river. At this point, if you want to see more sights, return back to Roemerberg and pick up the city tour there (stop 9 on that tour). Or continue down this river walk till the next pedestrian bridge (past another bridge for cars and trucks), the Holbeinsteg. Cross this bridge for another view of Frankfurt or to visit the Staedel Museum (shown to the left of the bridge in the photo below). The collection at the Staedel, while not huge, is good with works from the Middle Ages to contemporary pieces and changing exhibits. Photographically, I found their interior galleries and bookstore interesting and wished I’d had more time there. 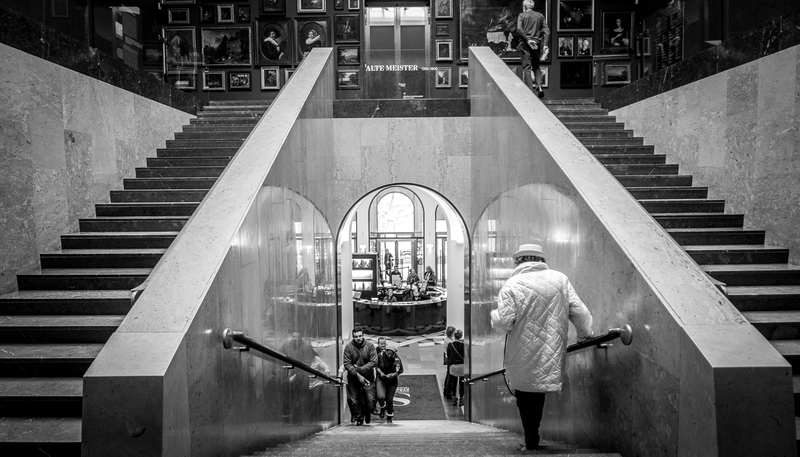 Pop into the bookstore or the adjoining cafe even if you don’t want to pay to visit the museum collection itself. From here, if you’re hungry, there’s a wonderful Greek and seafood restaurant, Parthenon, a few blocks away from the river from the museum. UPDATE: This restaurant now shares the space with Kennedy’s, a steakhouse. Locals tell me the food is still good but the prices have gone up and the service isn’t what it was. But see for yourself if you’re in the area. 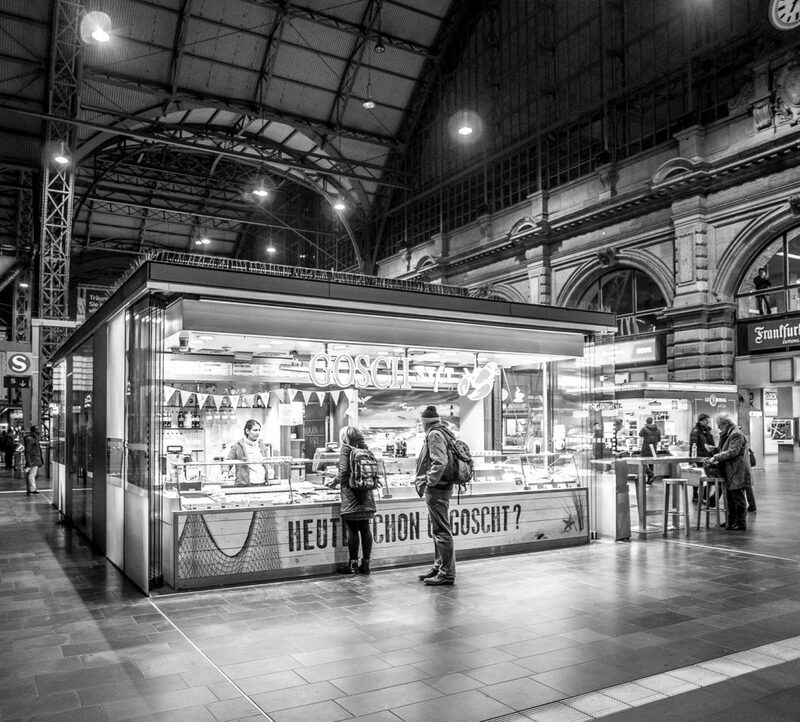 You’ll find a wealth of cheaper eats down around the train station, but I’ve had a few excellent seafood meals here at Parthenon in case you want something a bit nicer than your DIY meal at the Kleinmarkthalle (i.e. china plates, cloth napkins and few if any other tourists yet actually reasonably priced compared to other fine restaurants in town). 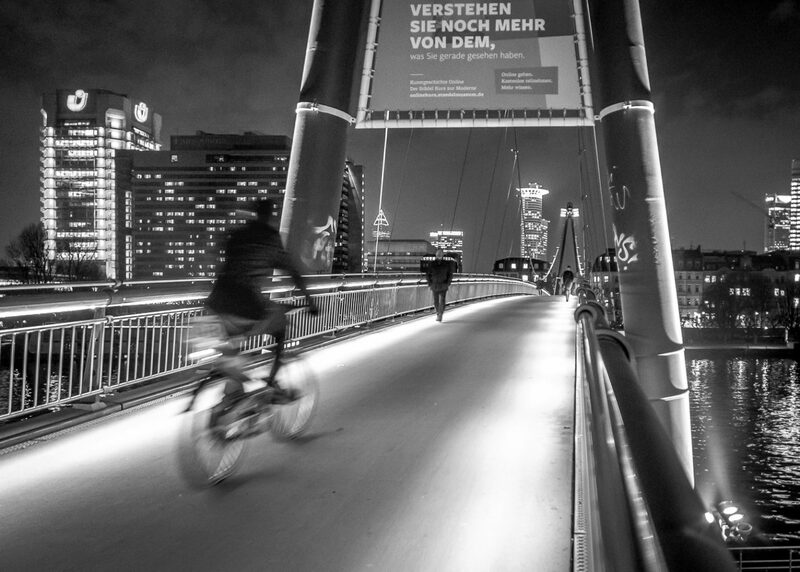 Either way, cross back over the Hobeinsteg (bridge) and note: If you’re here in the evening, you can get some wonderful night shots of and from this bridge of the river and surrounding buildings. 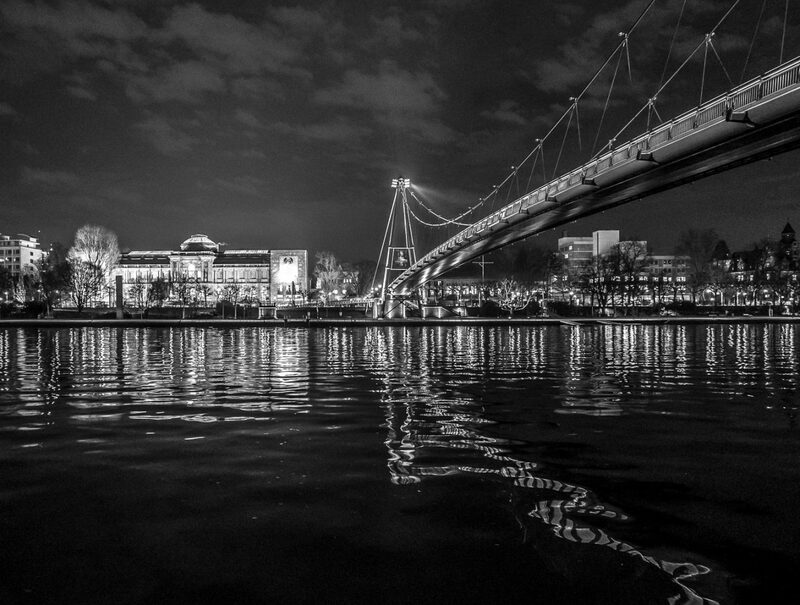 I’ve stuck to using only black and white images for this piece, but the color photos of the river at night can be beautiful. You can head straight up Moselstrasse from the bridge then turn right on Kaiserstrasse and you’ll be at the train station. There are additional photo opportunities here, both day and at night. Glance around the train station then look for the “S” sign for the S-bahn which is the train you’ll take back to the airport if you go this route. If you do the city tour and end up back at Hauptwache, be aware that several trains leave to the airport from there. If you get confused, just asked one of the many security or station police in the area. Most people will speak enough English to point you to the right train for the airport. Once you return to the airport, you won’t go back from the train station the way you came (if you’re flying out of Terminal 2). Instead of the bus, all the signs direct you to the inter-terminal train. Just follow those signs, get on the short shuttle ride then once at Terminal 2, look for the signs to know where to check in for your flight since there are two main areas, D and E. It’s actually quite easy. That’s it. 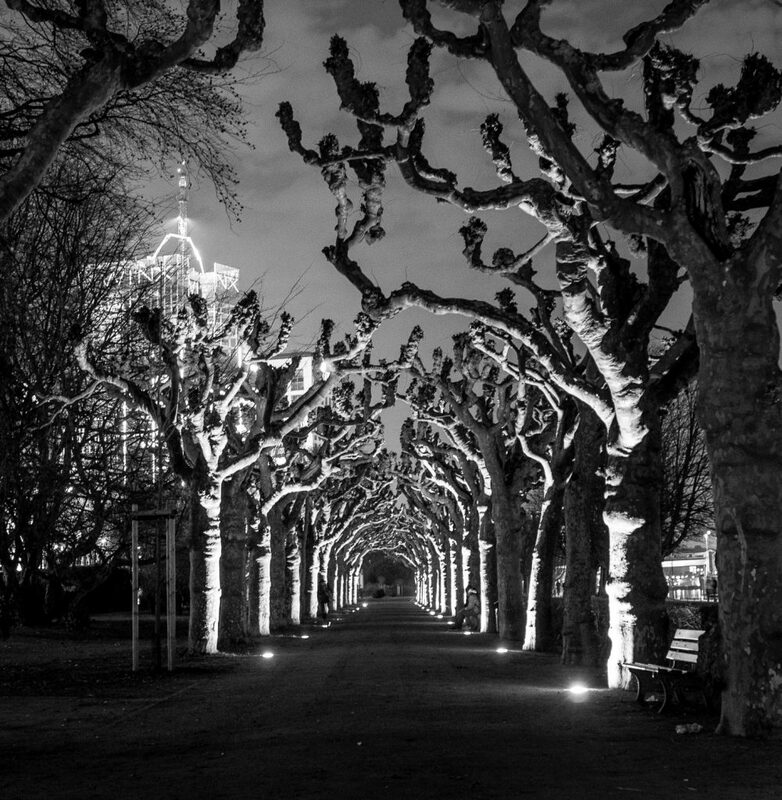 I hope you enjoy your stopover in Frankfurt and get some wonderful photos even in the short time you have there. 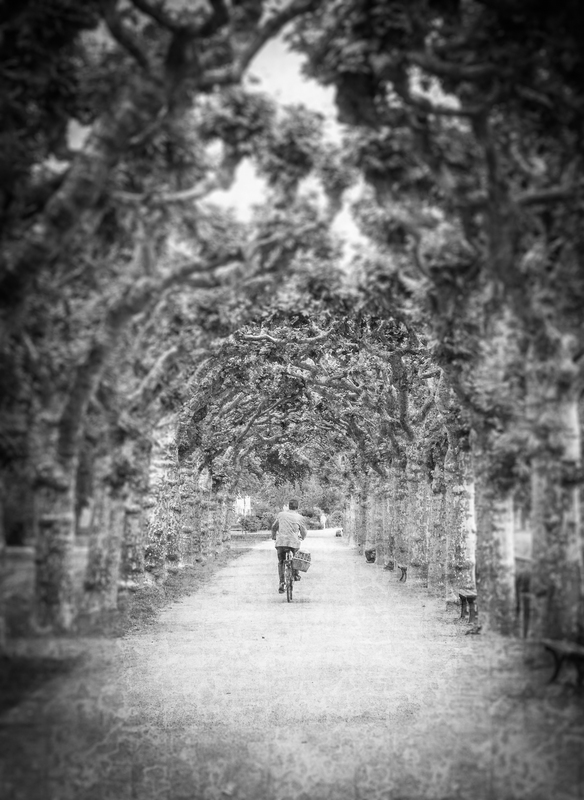 From a photography standpoint, I know I could have done better with more time there in Frankfurt. Thus, I think of my stopover trips as reconnaissance for next time. The shots you see are actually from two stopover trips, the most recent in February and the other in June a few years back. There are many other things you could see beyond what I’ve covered here such as going up for a city view in the Main Tower or sitting outside quaffing apple wine (a bit of an acquired taste) in Sachsenhausen. 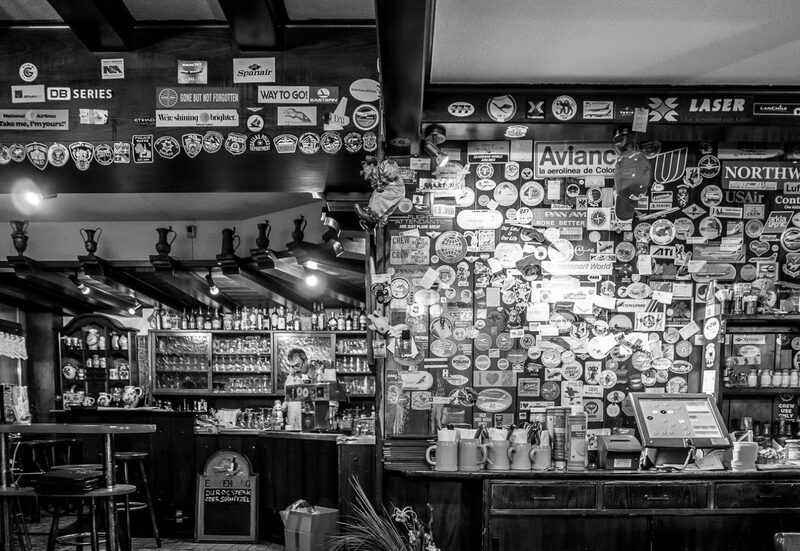 For me, if I did have more time and went back, here’s what I would photograph: The cafes. As you walk through the downtown area, look inside (or better, stop inside) one of the many cafes. They are gorgeous. They make the average Starbucks here in the States seem like a 7-11 in comparison. The people, the ambiance, the whole cafe culture is something I’d love to capture. So if you think about it, take a look yourself. Also, if you want tips on how to make better photos on your trip, check out my Beginners Guide to Making Awesome Travel Photos. It’s free and can be helpful to all levels of photographers. Finally, if you’re looking for things to do on other stopovers, check out Layover Ninja. Of the three things you most avoid that may be what you most need — suffering, failure and boredom — the latter seems like the most innocuous. Suffering and failure might feel more like an open wound or severed limb. 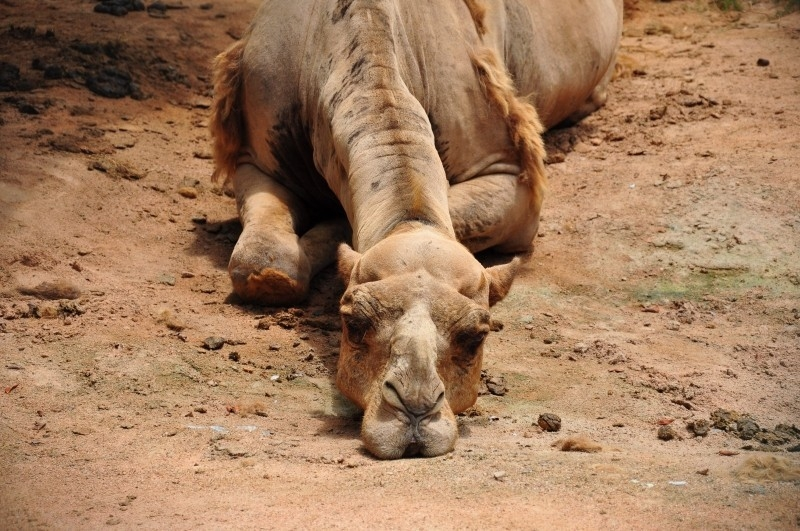 In comparison, boredom’s more like a hangnail: not pleasant, but more of an annoyance you’d prefer would go away. You and I do all sorts of things to avoid being bored when in fact, embracing boredom may be one of the best things you can do to enhance your creativity and problem-solving abilities. Being bored (and I’m talking about short-term boredom such as standing in line, being stuck in traffic, waiting for an appointment, etc. as opposed to long-term situations like a less-than-stimulating job) provides something rare: mental space for daydreaming. Without white space or a blank mental canvas, we don’t allow ourselves the ability to imagine. And without imagination, it’s hard to be creative. Those stretches of time when you have nothing else to consider gives you the chance to make seemingly random connections that are at the heart of creativity. So much of our creative life occurs indirectly: we back into ideas or connect dots from different realms. Welcoming boredom or opportunities to not think about anything in particular allows you to ponder things in a different, non-linear way. And that’s when the creative ideas often flow. But you’ll never get there if don’t open yourself to boredom. And if you’re like me, you can’t do that unless you address a hidden but powerful addiction: distraction. An addiction? You tell me. How long can you go without checking your phone or email or Facebook or a TV screen? How comfortable are you with silence? How often do you read the ads on the metro or subway just to have something to do? Distraction. It’s an addiction in our society and all the worse for the fact we don’t realize we suffer from it. Distraction not only robs us of creative thought, it diverts us from deep thought. We’ve become so ingrained at checking our devices and living in a constant state of unfocus that we likely don’t even realize the toll it has taken on our ability to do better, insightful work. No one ever changed the world, created a new industry, or amassed a fortune due to their fast email response time. His point is that to do the kind of breakthrough work that makes a significant difference to society, we need focused time and effort. And that’s not easy in a culture addicted to distractions. Newport offers a wealth of solutions in the book, but one of my favorites is this. Because distraction is so strong, we can’t beat it by trying to contain it. That’s why the approach many promote of carving out say, a day a week, for focused work with no social media rarely succeeds in the long run. That’s like telling an alcoholic to not drink one day a week. You don’t overcome addictions that way. Instead, Newport suggests a rather radical flipping of that process. Instead of carving out time in your week for focused work, instead, think of your week as being all about focus. Then, create small windows within each day for distraction. For example, as much as you can, arrange your schedule so that you refuse to go online or check your phone except every two hours and then for only 15 minutes. Be ruthless in sticking to this schedule. If you need to look something up online for the focused work you’re doing, wait until your two hours are up. If you absolutely can’t proceed without that information, at least wait five minutes. That way you’re training your brain not to give into the addiction pathology. You’re forcing yourself to at least pause before you automatically go online. If you don’t do something dramatic like this, distraction will kick in. As an addiction, that means our brains have become trained to default to distraction whenever we’re agitated, bored or semi-engaged in something else. You need to break those habits of distraction and this reorienting your schedule is one way to do that. Since reading Deep Work, I’ve tried this approach. I haven’t always been successful (addictions die hard), but when I stick to it and orient my day around focused time with distraction breaks rather than the other way round, the results have been dramatic. I get far more done and I haven’t missed out on any emergency emails, Slack messages or tweets that I just couldn’t live without. I realize this last suggestion doesn’t relate directly to boredom. But it is a powerful way of breaking free of the addiction of distraction. So is embracing boredom. I highly recommend giving both a try. For when you do, you begin to realize how much you’ve been missing in your attempt not to miss out on anything. If you haven’t already, check out the overview of this three-part series on the three things we avoid that we may most need, as well as the specific entries on suffering and failure. Failure. So many of us go to great lengths to avoid it. But should we? What if one of the greatest secrets to success turns out to be how we think about and approach failure? In her book, Mindset: The New Psychology of Success, Stanford psychologist Carol Dweck states that people tend to have one of two different mindsets or ways of interpreting the world. The first is what she calls a “fixed mindset” that assumes what we’ve got in terms of talent, intelligence or creative ability is all we’re ever going to have. Those with a fixed mindset judge success based on how they line up against some set standard. They feel better about themselves if they score well against that standard. They also pursue success or flee from any chance of failing in an effort to prove how innately talented or bright they are. If they get an “A,” that shows how smart they are. If they get a “C,” that affects their very identity as they now feel less smart just because of an average grade. In one world — the world of fixed traits — success is about proving you’re smart or talented. Validating yourself. In the other — the world of changing qualities — it’s about stretching yourself to learn something new. Developing yourself. In one world, failure is about having a setback. Getting a bad grade. Losing a tournament. Getting fired. Getting rejected. It means you’re not smart or talented. In the other world, failure is about not growing. Not reaching for the things you value. It means you’re not fulfilling your potential. In one world, effort is a bad thing. It, like failure, means you’re not smart or talented. If you were, you wouldn’t need effort. In the other world, effort is what makes you smart or talented. In short, if you see the world through a fixed mindset, failure will always be bad. Growth mindset people, however, will see it as an indicator that you are improving. Two very different approaches to failure. If you’re locked into a fixed mindset, I may not convince you failure can be a useful thing. But one way I’ve found to make failure seem less intimidating for anyone is this: redefine, or rather, reframe it. Failure is a catchall term we use for anything that doesn’t go as planned. But as travelers know, sometimes the best journeys aren’t the ones we set out to take. What one person considers a failure, another sees as a boon. It all comes down to your perspective and that, in turn, is affected by terminology. So let’s explore some other labels or ways to consider failure. …as long as you’re still breathing, it isn’t over. Failure is only failure if it happens in the last chapter – otherwise it’s a plot twist. So true. If we see the story of our lives as long-form narrative, even some major setbacks are just road bumps that add interest. They are what build character, increase our resilience and make for more compelling lives. If you try something and it doesn’t work out, you haven’t necessarily failed. You succeeded in trying. That’s a win. The biggest problem with avoiding failure is that you never try anything new. You take no risks. And if that happens, you never grow or frankly, truly live. How many times have you made a “mistake” only to find that the end result was better than planned? Would you call that a failure? No way. In the Renaissance, artists took the word pentimenti which originally meant regret or remorse and redefined it as meaning a reconsideration or change of thought. In this video from The Getty Museum, you can see how these “reconsiderations” play a big role in improving works of art. In learning how to play a musical instrument, you’ll make multiple mistakes. That’s all a part of the process and why you practice. Those mistakes aren’t failures. They are essential steps in building your skills and capabilities. So-called failures make us aware for areas in which we need to improve. Without periodic failures, we can fall into the trap of thinking we’re successful at everything. That not only enhances arrogance, it decreases our desire and ability to learn new things. Again, like not trying or risking, the result is stagnation and complacency. As Thomas Edison famously noted, “I have not failed. I have just found 10,000 ways that don’t work.” He saw all that effort as a natural part of the process of eliminating unknown factors. This process includes experimentation (for exploring alternative approaches when you don’t know where to start) and testing to reduce unknown variables (for when you know where to start but not how to proceed). You’ll kiss a lot of frogs to find a prince, but that’s all part of the process. I remember hearing the story of an executive who made a tremendous blunder costing his company something like $20 million. He walked into the CEO’s office and handed in his resignation. The CEO read the letter then tore it up saying, “I just spent $20 million to make you a better leader. Now go back and do your job.” That CEO understood one of the most valuable aspects of so-called failures: If we learn from the experience, we let it change us. We improve. We become wiser. We learn far more from failures than successes because we pay better attention. And in so doing, we gain hard-won yet invaluable experience. As a result, we do better work not in spite of our failures, but because of them. So I say to you, stop thinking about failure as something to avoid. Use one of the alternative terms above to name it for what it is, a positive, not a negative. A necessity, really, for any creative endeavor. Now go back and do your job.